Welcome to the Rivermont Avenue Heritage Trust, the official website of the Friends of Rivermont Historical Society. The Rivermont Avenue subdivision was planned as a residential suburb of Lynchburg in the early 1890s. The name “Rivermont” can be traced to the 1850s’ property of William Daniel, Jr. and his wife Elizabeth Hannah Cabell. This original property stretched from near Point of Honor to the current Rivermont Avenue. Our neighborhood traces its beginning to the opening of the Rivermont Bridge over Blackwater Creek in 1891. 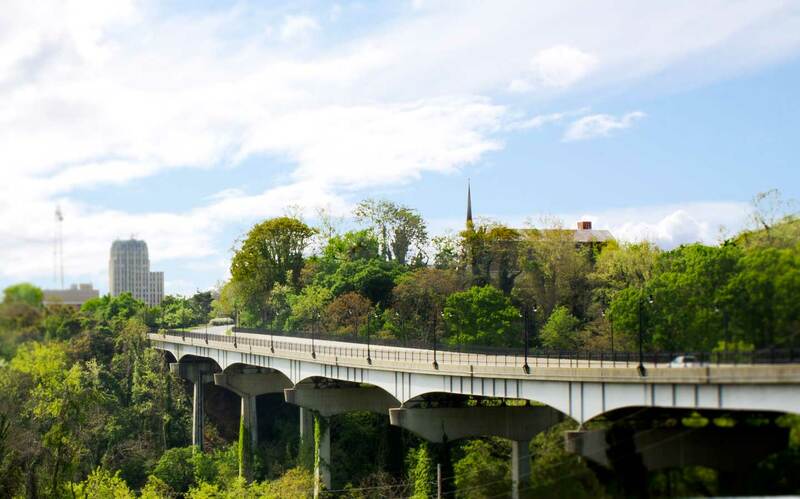 The Rivermont Bridge, considered in its day to be an engineering marvel, connected downtown Lynchburg with the Rivermont Avenue neighborhood. Unlike the rest of Lynchburg, which was laid out on a grid, the developers let the topographical curves dictate the route of Rivermont Avenue. Although our gently rolling hills and curves parallel the James River, Rivermont Avenue was carefully planned and was, in fact, one of the nation’s earliest planned communities. Requirements for building type, size, set back, and minimum cost were written into the deeds when lots were sold. From 1890 to WWII, Rivermont Avenue attracted the building of many businesses, as well as middle- and upper-middle-class family residences. Our district features some of the finest representations of architectural styles of that period. The Rivermont Avenue Historical District is the largest of Lynchburg’s eight historic districts, stretching from the Rivermont Bridge to Oakwood Country Club. Our district is listed on the Virginia Register of Historical Places and the National Register of Historical Places. Our neighborhood achieved historic district status in 2002, mainly through the efforts of the Friends of Rivermont, which then became the district’s historical society. The Friends of Rivermont Historical Society is dedicated to preserving and improving the beauty, safety, and community spirit of historic Rivermont. Please join us for a walk, jog, or drive through our neighborhood, one of the most beautiful, varied, and architecturally significant experiences Lynchburg has to offer. Meanwhile, enjoy our website’s virtual tour, historical and topical site pages to introduce you and further enhance your experience of the Rivermont Avenue Historical District.